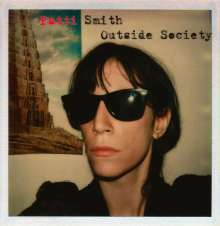 Der Artikel Patti Smith: Outside Society: The Best Of Patti Smith wurde in den Warenkorb gelegt. Erste labelübergreifende 1CD Best Of mit allen wichtigen Songs der Arista- und Columbia Years 1975 - 2007. Zusammenstellung von Patti Smith, die auch für das Booklet ihre ganz persönlichen Song Notizen beisteuert. 18 Songs, angefangen vom 75er Debüt-Album "Horses" bis zum 2007er Album "Twelve". Alle tracks wurden von Greg Calbi und Tony Shanahan (Mitglied der Patti Smith Band) sorgfältig remastered. Rock And Roll Hall Of Fame inductee Patti Smith raises the curtain on Outside Society, a new collection of her signature songs on the Arista and Columbia labels. The landmark 18-song release marks the first single-CD collection to span Patti's entire body of recorded work. The chronologically arranged tracks move from 1975 (her debut album, Horses, with "Gloria" and "Free Money") through 2007 (Twelve, with her cover of Nirvana's "Smells Like Teen Spirit").